Today, many complex conditions - from cancer to gynecologic issues to kidney conditions and more - can be treated with minimally invasive surgery using the da Vinci® Surgical System. This remarkable device includes a high-definition vision system (to enhance the surgeon's view of the surgery site), as well as advanced robotics, which assist your surgeon with great precision and control. The da Vinci® Surgical System is designed to provide surgeons with enhanced capabilities. A high-def 3-D vision system gives your surgeon a magnified and clearer view of the surgical site. Your surgeon controls the da Vinci® Surgical System, which translates his or her hand movements into smaller, more precise movements of the tiny surgical instruments which are inserted into your body through small incisions. Though it is often called a "robot," da Vinci® cannot act on its own. The surgery is performed entirely by your doctor. 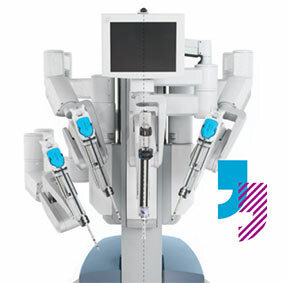 Have A Question About daVinci Robotic Surgery? If you're wondering how daVinci© Robotic Surgery works ... whether you're a candidate for robotic surgery... or any other topic related to this new, advanced surgical technology ... we invite you to "ask the experts." Just email your question. An expert from the MidState Medical Surgical Center will get back to you and answer all your questions about the robot-assisted surgeries available right here, in Meriden, CT.
Prostate cancer is among the most commonly diagnosed cancers, affecting one in six men. Today, due to early detection and aggressive monitoring and treatment, prostate cancer survival rates are among the highest of any cancer. Radical prostatectomy, which surgically removes the prostate gland, is the most common treatment for prostate cancer. Traditional open prostatectomy requires an 8 to 10-inch incision and commonly results in a lengthy and uncomfortable recovery. With new advanced technology, you may be a candidate for an innovative, less invasive procedure called the da Vinci prostatectomy. This robotic-assisted procedure uses a state-of-the-art surgical system designed to help your doctor perform the most precise and least invasive prostatectomy available today. A wide variety of conditions can affect a woman’s reproductive system, and given the type and severity of your condition, a hysterectomy may be recommended as the best course of treatment. wide incision below the navel. The procedure can be painful with a long recovery. procedure called the da Vinci hysterectomy. This robotic-assisted procedure uses a state-of-the-art surgical system designed to help your doctor perform the most precise and least invasive hysterectomy available today.